I'm starting to think that I recieve a defective board. Which distributive, uboot and script.bin you use? Please give me the links, I will compare with my device. By the way, it can be a problem with overheating because of not good quality power supply? Maybe I should try another. When you're using the Armbian image then please see above. The thermal read-out is too low so in reality it will be a bit higher. But how do you know that the voltage is higher than 0.2V? See above. I use the very same image on Orange Pi PC (where we know that voltage regulation should work as expected) and Orange Pi One and only exchange script.bin in between. On the One I get both higher consumption and temperatures (the latter being wrong but that doesn't matter since it's a relative difference of about ~20Â°C!). The only real source for such a difference is Vcore voltage. If reliability at 1200 MHz can be confirmed then this is also a clear sign that Vcore voltage must be higher than 1.1V or let's better say pretty close to 1.3V! TL;DR: The voltage regulator on Orange Pi One can be switched through GPIO settings between just two Vcore voltages (the higher the voltage, the higher the possible clockspeed up to an limit by specs of 1.4V). 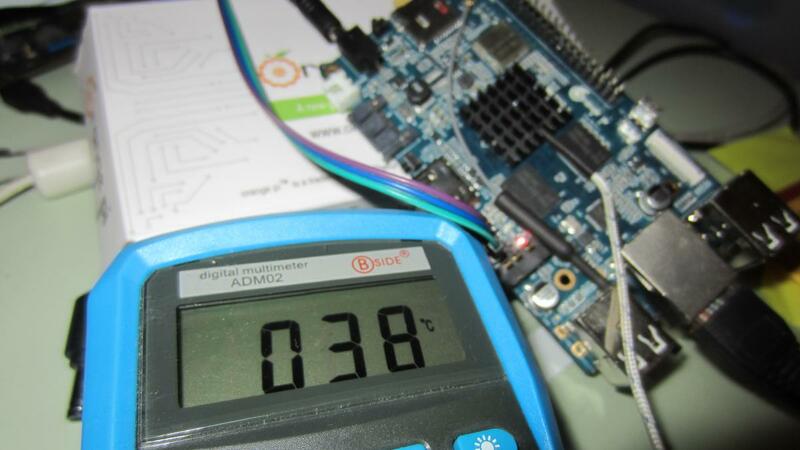 According to Orange Pi forums the Vcore voltage should be switched between 1.1V and 1.3V for clockspeeds above 648 MHz. But the real voltages used seem more like ~1.3V and ~1.5V clearly exceeding the 1.4V maximum. BTW: This is not about overclocking but overvolting. You need high Vcore voltage to let the SoC run reliably at high clockspeeds. But what we experience here is that we thought our boards are able to switch between two sane voltage settings but in reality the 'lower' one is already on an upper limit and the upper one clearly exceeds tolerable specifications if cpufreq is at 720MHz or higher with the common fex settings developed/used the last days. Yes, no screen console @moment. Armbian is using standard opensource u-boot which currently does not support HDMI console. Can confirm this. To check whether my display is working correctly I used loboris' Ubuntu 15.04 Mate image and connected it (with script.bin fixes for DVI applied). Worked flawlessly. Even the use of low voltage at low frequencies leads to overheating(65-75 degrees in chromium and aptitude launched with upgrade). Much more powerful Atom Z3735F and qualcomm 801-810 are heated less. Awful to energy-efficient A7 heated so. I will think about replacing the radiator to a larger one. Awful to energy-efficient A7 heated so. We had to learn the last months that the primary source of H3 heat problems was overvolting (it seems H3 is made in a 40nm process like the A64 -- this seems to be the source of overheating problems). When these settings were fixed on Orange Pi Plus/2/PC then everything was ok (without a heatsink it was already a bit hard to trigger thermal throttling or to get close to 80Â°C or beyond). The voltage regulator accessible through I2C seemed to switch voltages correctly. With the One the situation changed: Here we have a new step-down converter used. Its Vout voltage can be adjusted using two resistors: Vout=0.6*(1+R1/R2). And the H3 seem to be able to switch between two states (U53 - SY8113b, Q5 - switching MOSFET on the PCB). Since the vendor doesn't comment on anything and didn't release schematic and no one took a Multimeter and measured the various testpoints on OPi One's PCB we can now just speculate about the values of these resistors and the real voltages used. But thermal and consumption values indicate that the voltages are way off and exceed 1.1/1.3V significantly. And this would explain why you're running in overheating situations. If you compare the thermal values for the same test (sysbench --test=cpu --cpu-max-prime=20000 run --num-threads=4) then it's obvious that the lower voltage used on my Orange Pi One must already exceed the highest voltage on the Orange Pi PC. And if you activate voltage switching on the One it gets even worse. And there's an important thing to mention: Currently with Armbian we have a situation where the internal thermal readouts are a bit off (reported too low), so thermal throttling jumps in too late (or in other words: internal temperatures are already higher than reported). New images are recompiling and uploading ... less than one hour from now will be online. I am using only a small heat sink. Temperatures were measured with low cost Multimeter but it's accurate enough for our case. These values are a bit too low (you'll realize with RPi-Monitor easily since if you power on the board the temperature 20 seconds after a cold boot is reported as being below ambient temperature) and I doubt that measuring the surface of a heatsink has anything to do with the SoC's core. Unlike the older SoCs (A10/A20) where a thermal sensor was included more by accident these sensors are now there for a reason: Throttling. And thx for uploading the images again! I know. My measurements are just little better than with thumb but it shows that we made a good job on boards with a proper voltage regulator. Some further fine tuning is expected. BTW. New images are up. You've been too fast! Again! Since HDMI is still not working. And I found out why 15 minutes ago: All that's needed is just removing "disp.screen0_output_mode=1920x1080p60" from boot.cmd prior to creating boot.scr. Then HDMI works. There's still a bit to do. I'm already preparing h3disp (an utility that's only useful with 3.4.x since it will take script.bin and modify [hdmi_para] section to support different HDMI resolutions, patch the fex and convert back -- to be useable with Xunlong/loboris images too) but will first have a look into OpenELEC's/jernej's last patches that are display related since it would also be great to get fbset support to be able to use any display resolution possible. Haha OK, well ... for screen I am willing to do this again at once. I'll add other two remaining boards too - I have a bit tight time scale so this might not be finished until evening. After the following reboot you have almost all latest fixes, working HDMI (on 5.00 images) and are more safe regarding overvolting/overheating on the OPi One. Images updated I also added Ubuntu desktop for ONE ... rest in the evening. I just tested the new Image. HDMI Sound is only on two Channels, speaker-test -D hw:1 -c 8 gives some downmix on left and right, like on all other Kernels, i2s support is not available (found it first on this Image http://www.diyaudio.com/forums/pc-based/285427-i2s-connection-orange-dac-4.html#post4614528). This image is booting much faster than all Images i have tested before.. I will check your improvements from time to time. So keep on with your excellent work. I am sorry but i am a noob to kernel developments, i just wanted to point out, what modules are missing, or better which i would like to see . Being a kernel developer is absolutely no requirement to contribute. Since you know who has made improvements in the area you're interested in you could simply ask there what has been changed to get feature XY to work (it's a basic requirement to publish sources when someone publishes an image based on GPL). This alone makes it a lot easier to integrate stuff and to provide you with a test version (it's really that easy in the meantime with Armbian -- the other Armbian guys did a really great job). BTW: Since I mentioned loboris above... Kudos to his great work even if I never liked his overclocking attempts. But without relying on his, ssvb's and yann|work's fixes Armbian@3.4.110 simply wouldn't be available for H3 devices yet. BTW, Have you try to boot those with internal PHY if patch is present? From first quick look this should be or it was designed to be selected from script.bin? Have you try to boot those with internal PHY if patch is present? From first quick look this should be or it was designed to be selected from script.bin? Just recompile the kernel without my reverse patch to be able to try out. Get back to you in a few minutes. But what about Zador's idea to create an empty lib/patch/kernel/sun8i-default/orangepiplus/opi_pc_one_disable_gmac.patch? You're already thinking about upgrade procedures later? It's more a temporary workaround for testing. If kernels require different set of patches, they should be separated to have different names, otherwise you won't be able to set up apt repository for upgrading. Looking at the patch - quick and dirty solution would be adding module parameter and setting it in u-boot script (kernel command line) since this looks like a built-in module. we don't have proper procedure for updating boot script yet. What about reading from script.bin ? It's defined which eth type is used. [sY8106A u-boot patch] I don't think so since it's from a week ago and 'sources/u-boot/v2016.01# find . -name sy8106a.c' returns nothing. with some unused GPIO and disable "opi_pc_one_disable_gmac.patch"? Currently GMAC driver probably doesn't like missing entry in script.bin and returns from geth_sys_request with error code. Just different solution. We still have must have two separate kernel bin. BTW: I am meeting Jernej next week. Something like PL08 or PL09 looks unused enough in all orange*.fex files and in H3 datasheet.